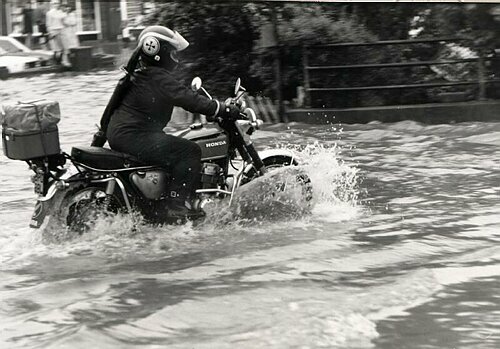 Flooding; The late afternoon of Friday 4 June 1982 brought heavy rainfall to Theydon Bois. Flooding developed particularly at the main cross-roads, creating a problem for returning commuters by tube or car. I reached my home in Blackacre Road to find my wife and daughter standing calf-deep in water, desperately baling out the passageway. I grabbed a couple of cameras and went off in search of pictures - an act of family desertion for which I have hardly been forgiven to this day. A motorcyclist fords the cross-roads heading towards the bridge over the railway.